(Dar es Salaam) Ifakara Health Institute seasoned researcher and former Deputy Director Dr. Godfrey Mbaruku has died. IHI chief human resources and operations officer Martha Baare revealed the sad news in her brief email to Institute’s staff yesterday. “My hands are trembling as I’m writing this email to you now. We have received very shocking news that Dr. Mbaruku has left us. More details will be availed later,” reads Baare’s email in part. 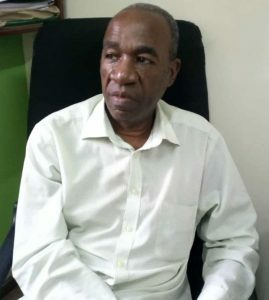 Information obtained later, indicated that the researcher died at his Mbezi Beach home on Sunday morning (September 2, 2018) and was to be buried at the Kinondoni Cemetery in Dar es Salaam on a Wednesday on September 5, 2018. Born in Tanga in 1954, Dr. Mbaruku (pictured) was an Obstetrics and Gynecology specialist with over 30-year experience as a medical doctor. Since 2004, he has served as Vice President of the National OBGYN Society (AGOTA). Dr. Godfrey received most of his training at the University of Dar es Salaam, and completed his PhD at Karolinska Institute in Sweden in 2005. He has worked in the fields of reproductive health, maternal and neonatal health, primary care and management of health services. As both a clinician and trainer, he has played a key collaborative role with local and international organizations in project development, teaching, monitoring and evaluation. As part of these efforts, he has worked tirelessly on behalf of local populations, as well as a huge number of refugees from neighboring countries. In June 2010, The Lancet profiled Godfrey as “An Early Hero of Modern Maternal Health.” In that profile, Ann Starrs, President of Family Care International noted: “Godfrey was one of the first heroes of the modern maternal health movement.